You can activate CentriQS during installation or after installation. 1. 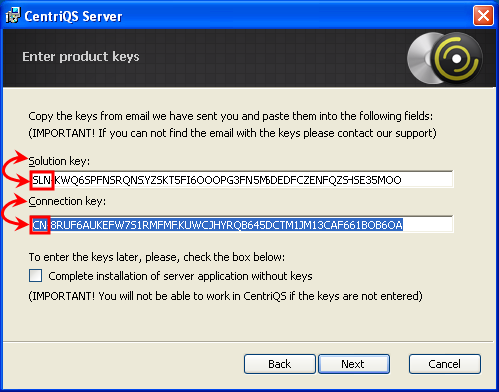 Double-click the SetupServer.msi file and follow the instructions given in the CentriQS Server Setup wizard. 2. On the Enter product keys page, paste your activation keys into the Solution key and the Connection key boxes. Important! Paste the key with prefix SLN into the Solution Key box and paste the key with prefix CN into the Connection Key box. 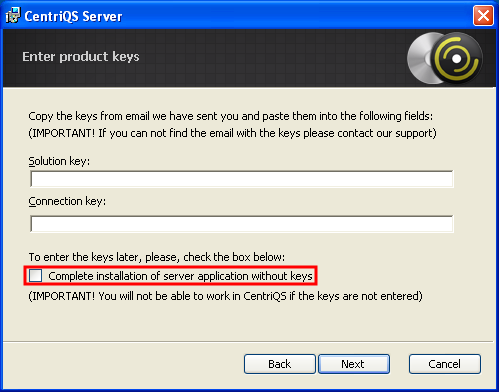 Note You can select Complete installation of server application without keys check box to continue CentriQS Server application installation without activation and activate it after installation is completed. 1. Log on to Configurator. 2. Click License keys and click Add license key in the toolbar. 3. Paste one of the activation keys and click Add, then click Add license key in the toolbar again, paste another activation key and click Add.